A few months ago someone posted a stitch pattern on Tumblr that caught my eye. I instantly fell in love with it and was wondering if there was some way I could work it into a shawl. 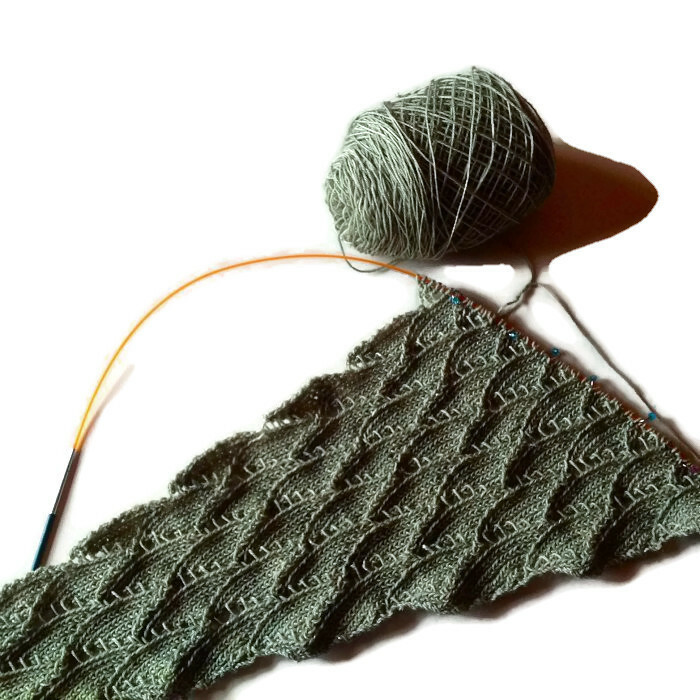 Lo and behold, just a day or two later, knitting designer, Melanie Berg, posted photos of a new shawl she was about to start pattern testing. I followed the test thread avidly and bought the pattern the same day it was released. This is a big shawl that takes over 200g of 4-ply, but I already had 400g of Oakworth 4 Ply from Eden Cottage Yarns that I’d bought last October. I’d had it in mind to make myself a cardigan, but couldn’t work up any enthusiasm for the idea. The Oakworth turned out to be perfect for this project. It’s very smooth and just lovely to work with. It’s also very crisp and the stitch definition is fantastic. Just what this pattern needed to highlight those lovely waves. I started, full of enthusiasm, but anxiety soon set in. I was really unhappy about how large and untidy the yarn overs looked. I was assured that blocking would fix this, but have to confess I was a bit sceptical! Those yarn overs look so wrong, I wasn’t convinced that even the magic of blocking would sort them out. Things went from bad to worse when I started decreasing on the left side. 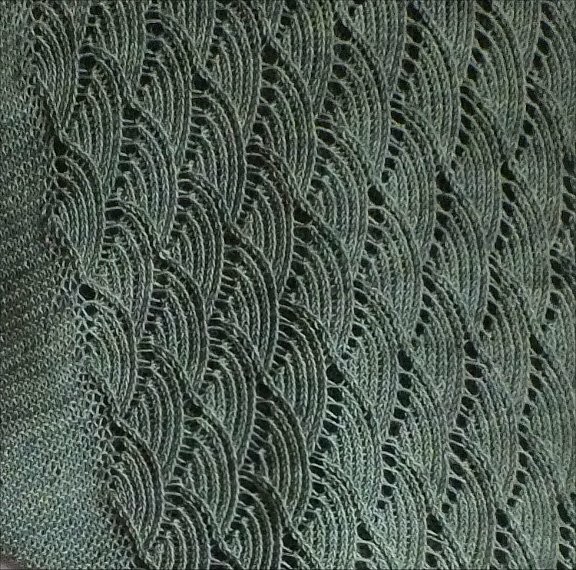 The patterns says to make sure that the decreases (k3tog and p3tog) are worked loosely so that those stitches don’t pull in, so that’s what I did. That edge looked so bad when I’d finished! I didn’t take a ‘before blocking’ photo of it, and now I’m wishing I had. Yes, you do have to work them very loosely. Yes, it will look dreadful. No, don’t frog it, blocking really pull it all into shape. 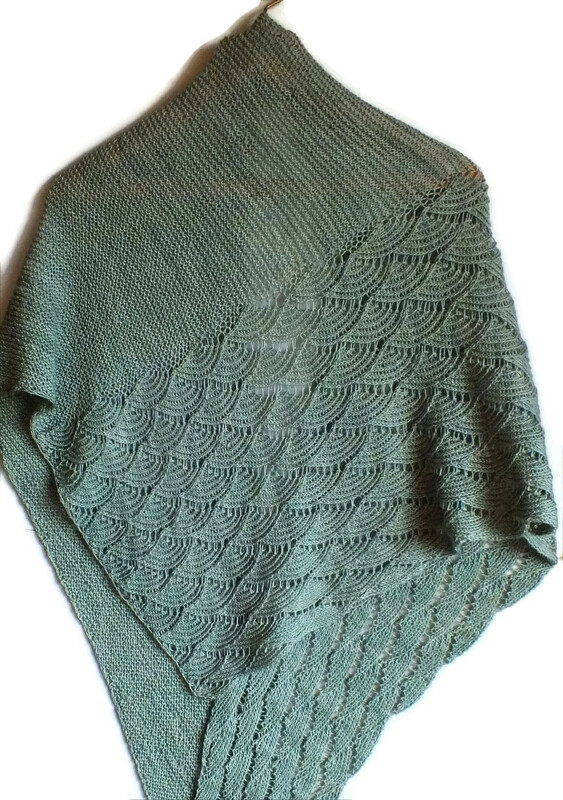 When I finished, I was convinced that I was going to have to frog it, at least back to where the garter stitch decreases started, if not the whole thing. By the time I started blocking it, I was thoroughly depressed and convinced that it was beyond saving. I soaked it, then put it on blocking wires. I didn’t want to stretch it particularly, as it was already so big, but I did want to get the edges on the garter stitch nice and straight and open up the waves a little. I didn’t put a wire on the wavy edge, I just pinned it between each wave. I was a bit more optimistic once I’d pinned it out! Oh, the magic of blocking! It always make me think about that fairy tale, The Elves and the Shoemaker. 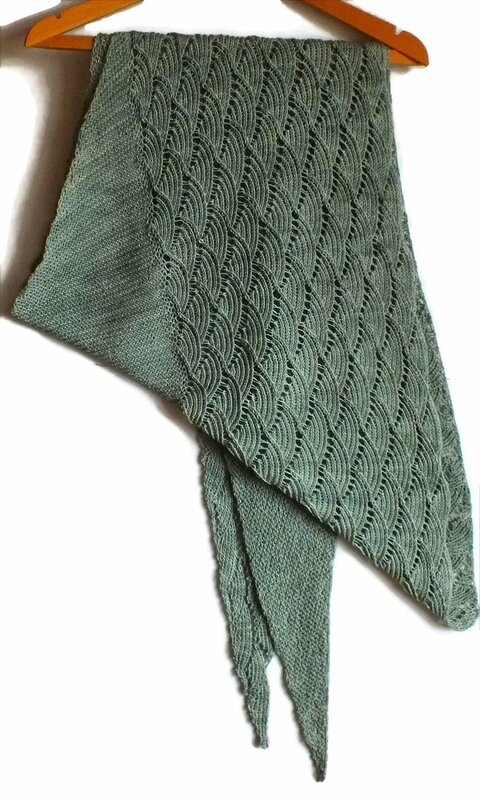 I produce a scrunched up piece of knitting and the blocking fairies transform it into something wonderful. I was absolutely thrilled with how it turned out. It’s pretty big, 102″ x 30″. This is a little bigger than the size quoted on the pattern, which I expected. My tension is a little loose and, usually, I’d go down a needle size but, as I had 400g of yarn, I knew I wasn’t going to end up playing yarn chicken with this one. Although it’s big, it feels nice and light. The long tapering ends mean they can be wound round and round, without it feeling bulky. 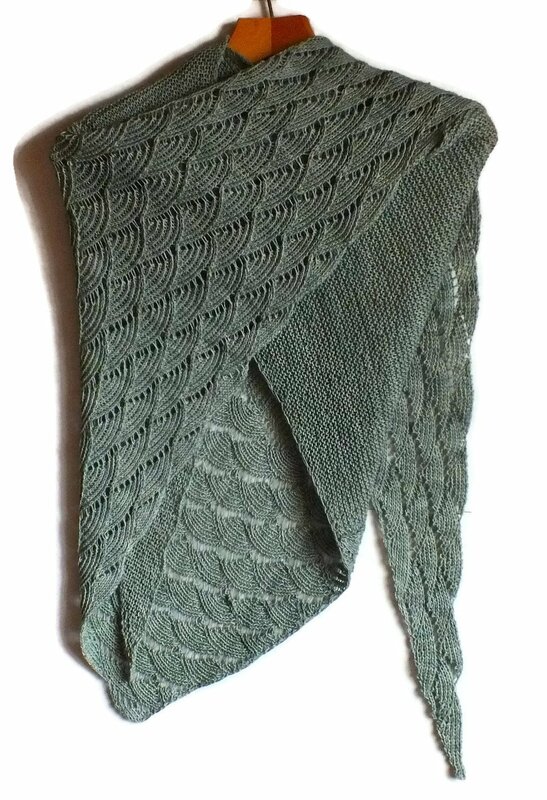 I was surprised at how well it works as a large scarf, not just as a shawl or wrap. Looking at the finished shawl, I feel a bit silly about getting so anxious. In the ends, I’ve even amazed myself! 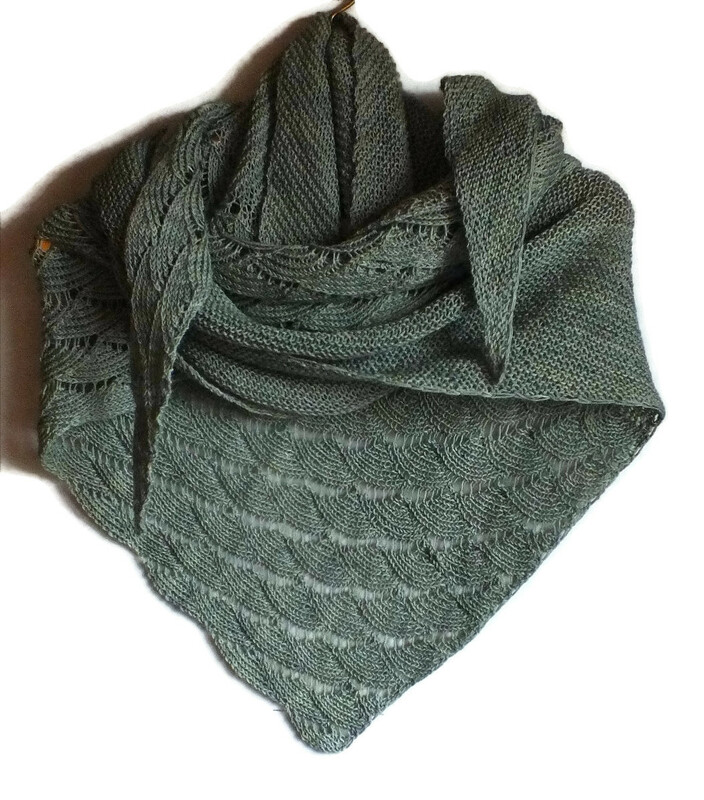 It’s such a lovely shawl, I’m so glad it all worked out in the end. Thank you 🙂 I usually get there in the end, although it often feels more like luck than judgement!